Here's our latest haggis creation - made with venison instead of lamb and Malt Whisky to add a richness and smoky whisky flavor to our award winning haggis. In Scotland, the fanciest Burns Suppers offer a Royal Haggis, made with venison - and we have finally obtained Scottish venison so we can offer the same to you. 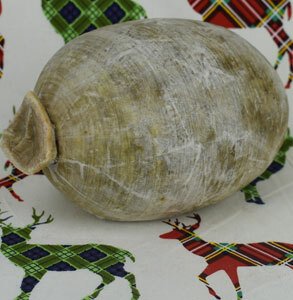 You can smell the whisky when this haggis graces your plate, and after two or three bites, you'll notice a smoky whisky flavor at the back of your throat. None of the burn, as the alcohol has dissipated during cooking, but the flavor is definitely there! The 2 lb. presentation size can feed 4-8 people, depending on the serving size. 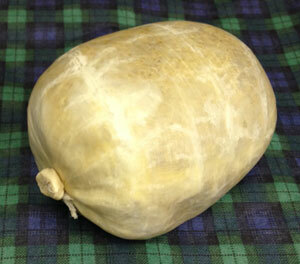 The natural casing gives you the most authentic haggis we offer, one you will proud to address and serve. Reheat as you would our regular haggis - steam in the oven in a covered water bath at 350 degrees for 45 minutes. Ingredients: Scottish venison meat, oatmeal, water. venison fat, venison liver, onions, Scotch whisky, salt and spices. We taught a French sausage maker to make haggis despite months of bureacratic forms and inspections from the USDA to finally approve the making of haggis. And you get the rewards - a crumbly delicious haggis made from American lamb, onions, Scottish oats and Andrew Hamilton's special spice blend. Shipping Policy: We ship via UPSwithin the 48 continental states. If we can ship your perishable package via ground transportation to arrive in the same time as UPS Express, we will ship via Ground UPS and reduce your shipping charges accordingly. Our goal is to get your package delivered in the right time at the lowest possible cost to you. Perishable cheese, smoked fish, haggis and bacon are shipped on Monday, Tuesday, and Wednesday only, via Second Day Air. Frozen langoustines, frozen soups and frozen bridies and sausage rolls are shipped Monday through Thursday via Overnight Air. We do not ship perishable items on Friday. I love Scottish Gourmet's regular Haggis, but this Venison Haggis is even better! 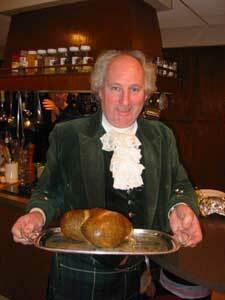 It was the crowning meal of my last 18th Century event and I will definitely order more in the future! This is a first for me. I have always wanted to try haggis. Being 50% scottish i guess you could say it is in my blood. I have never been afraid to try it. And i have to say Haggis is one of my favorite foods now. I LOVE LOVE it! !